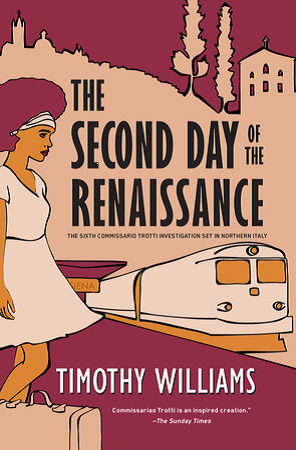 Originally published between 1982 and 1996, Timothy William’s COMMISSARIO PIERO TROTTI mystery series was a big hit with both readers and critics alike, and Williams was named one of ‘The Observer’s 10 Best Modern European Crime Writers’. Now, after a 20 year hiatus, the author has returned to Northern Italy, where Inspector Trotti, having left the force, finds he is on the receiving end of some unwelcome attention. Commissario Piero Trotti has eased into an agreeable retirement after spending decades working in an unnamed city on the River Po. But his new found peace is cut short when a former colleague calls him to Siena with chilling news….a known hit man has returned to Italy to kill him. As he flees across Italy to escape his pursuer, Trotti must acknowledge an unpalatable truth – his errors and failed gambles over the years have left the indelible stain of innocent blood on his hands. Although tormented daily by his mistakes, Trotti now has to contend with a very real threat, a would-be assassin who is hell bent on retribution. For its long view of modern Italy’s politics, corruption and criminality, for its portrayal of an ageing, flawed policeman unable to compromise on his rigid view of justice, and for its enthralling delivery, THE SECOND DAY OF THE RENAISSANCE is truly unmissable for all crime fiction lovers.